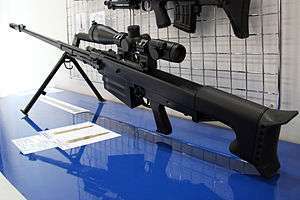 Russian heavy semi-automatic sniper rifle chambered for the 12.7×108mm round. Despite having been designed to be used against equipment, the rifles also proved useful in dispatching enemy personnel from superior range, including enemy snipers. This, however, requires that the enemy cannot use arms with similar effective range - which e.g. was the case during the War on Terror in Afghanistan. The latter theater is the site of the farthest scored hit with an AMR in combat. Anti-materiel rifles can also be used in non-offensive roles, e.g. ; for safely destroying unexploded ordnance. 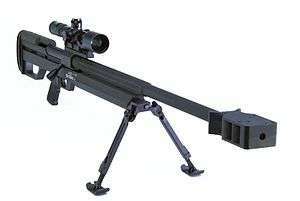 Anti-materiel rifles are similar in form and appearance to modern sniper rifles and can often serve in that role, though they are usually chambered for cartridges more powerful than are normally required for killing a human and can operate at a greater range. In general, anti-materiel rifles are chambered for 12.7×99mm NATO (.50 BMG), 12.7×108mm Russian, 14.5×114mm Russian, and 20mm cartridges. The large cartridges are required to be able to fire projectiles containing usable payloads, such as explosives, armor-piercing cores, incendiaries, or combinations of these, as found in the Raufoss Mk 211 projectile. The recoil produced by the employed cartridges dictates that these rifles are designed to be fired from the prone position. Bipods and monopods and muzzle brakes are used as accessories to employ these rifles as comfortably and accurately as possible. Firing several 12.7×99mm NATO, 12.7×108mm Russian, or larger caliber shots from the (unsupported) standing position or in a kneeling position would be very uncomfortable for the operator and can result in them being knocked over or sustaining a shoulder injury. Due to the considerable size and weight of anti-materiel rifles and other support equipment, sniper cells operating in 2- or 3-man or larger teams have become a necessity. This section lists some anti-materiel rifles, sorted by country where the weapon was originally designed and/or manufactured. ↑ "Sniper Rifles". Archived from the original on 2010-04-03.